Jellyfish are back! According to an article in The National, thousands of jellyfish have been caught off the coast of Ras Al Khaimah, mainly blue blubber jellyfish (Catostylus). They have also been found washed up along shores in the emirate. To know more about the blue blubber jellyfish, view the information sheet here. While jellyfish are not dangerous, they do unleash a nasty sting. As operator of a private beach club or hotel beach, how can you stop jellyfish from attacking and driving swimmers away? This can be achieved by installing jellyfish nets. We design, manufacture and install jellyfish nets to block jellies from swimming areas and protect swimmers. 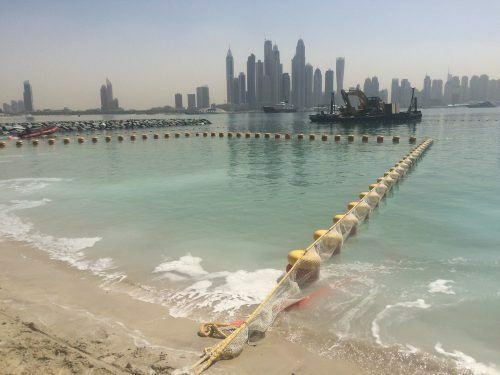 Just last month, our team installed another net at a resort on Palm Jumeirah in Dubai. The Ecobarrier jellyfish nets are designed not to entangle other sea life and are a sustainable solution to protect the marine environment. The nets are anchored to the sea bed and require regular maintenance to effectively repel jellyfish back out to sea, and to avoid the nets to be left out in the ocean or end up in a landfill. 4. Designed for quick and easy repositioning or removal, maintenance and re-installation. If you’re in need of further information about jellyfish nets, please call +971 4 8853944 or use the contact form on our website. Ecocoast is the global leader in pioneering solutions for sustainable coastal and marine developments, and is at the forefront of designing, manufacturing and distributing globally a range of marine protection and demarcation products under the brand Ecobarrier. In 2018, Ecocoast launched its innovation lab, Ecolabs – the Middle East’s first innovation lab for pioneering marine technologies to solve the world’s most pressing marine problems.